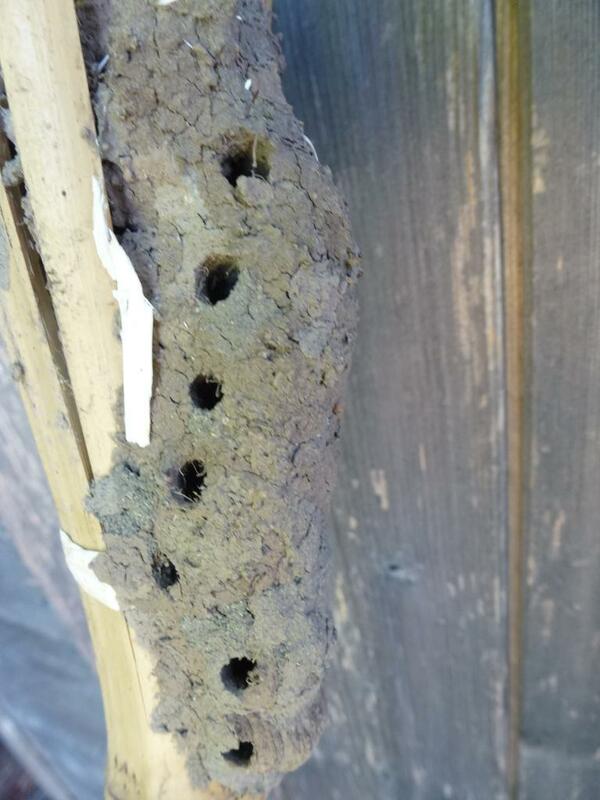 I find it so interesting the way different insects (animals in general) use different materials to build their homes, or in this case the home for their young. I was preparing the spare bedroom which hadn’t been used for a while and found this outside the window but inside the shutters. I recognised immediately what it was; but this was the first one in a reachable position that I could investigate. 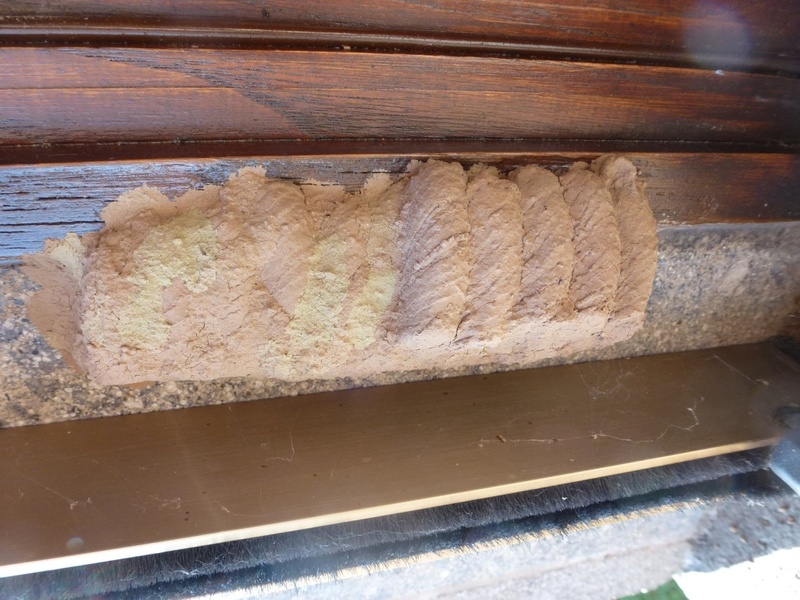 The nest is constructed of mud and stocked with spiders for its young to eat as they emerge from the chrysalis. 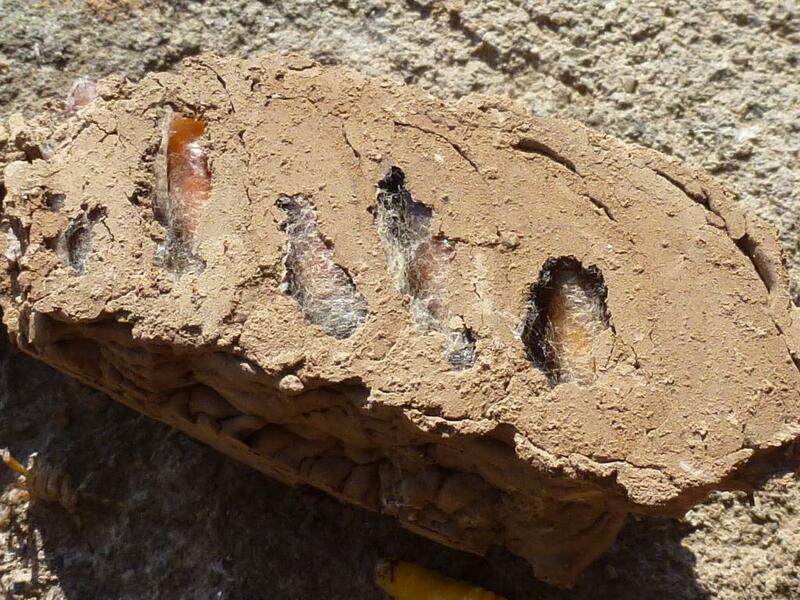 Several cells are connected alongside each other, sharing the mud walls, but they are individual, sealed tube. Each cell will contain one egg and be provided with food for the larvae when it hatches. The food is in the form of small spiders with between 6 and 14 per cell. These are mostly small crab or jumping spiders. 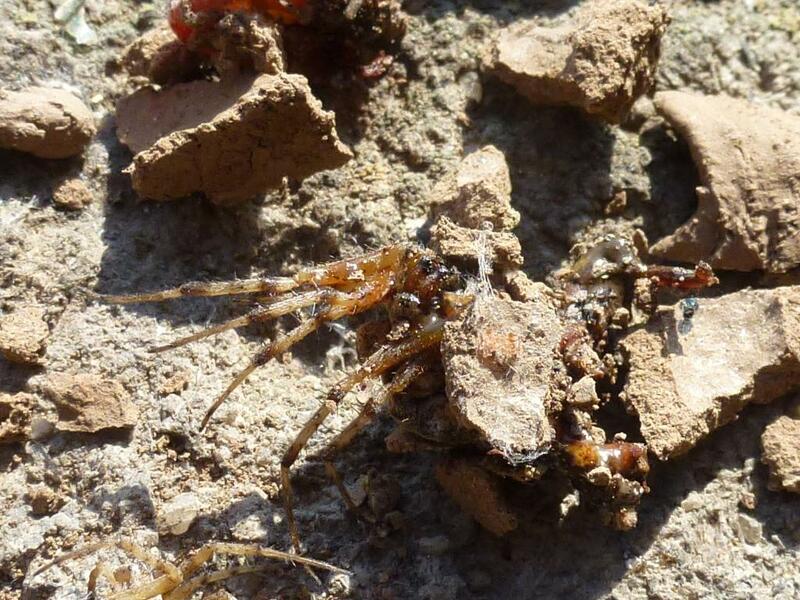 The spiders don’t seem to be dead, but paralysed by the adult’s sting so that they remain fresh for the emerging larvae. 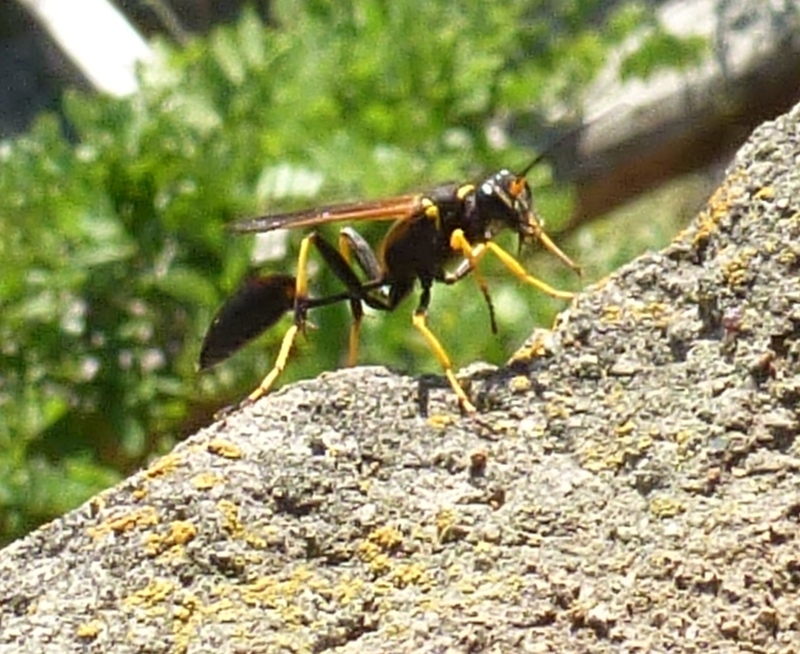 This is the insect in question: the thread-waisted Wasp, Sceliphron spirifex. I can’t imagine how many trips it must take to construct the nest; sometimes they are huge! 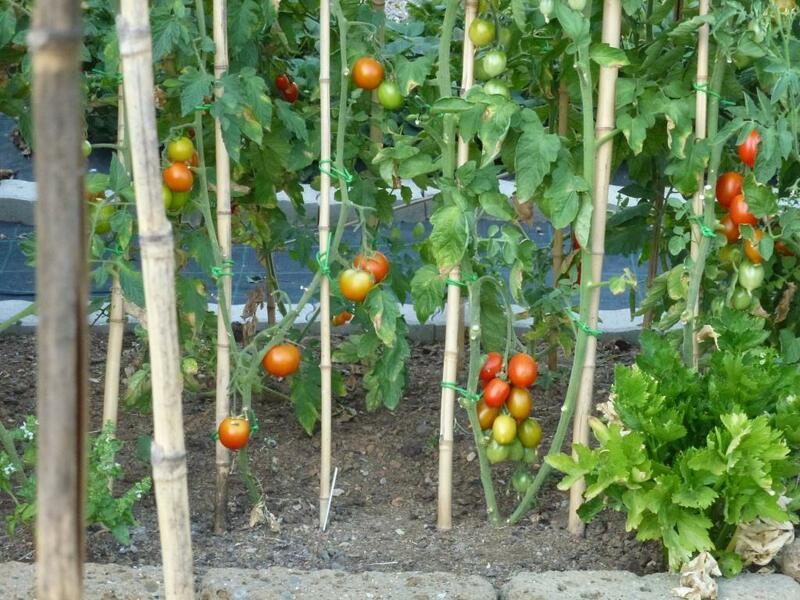 So many things have begun to be harvested since last GBHD in June. 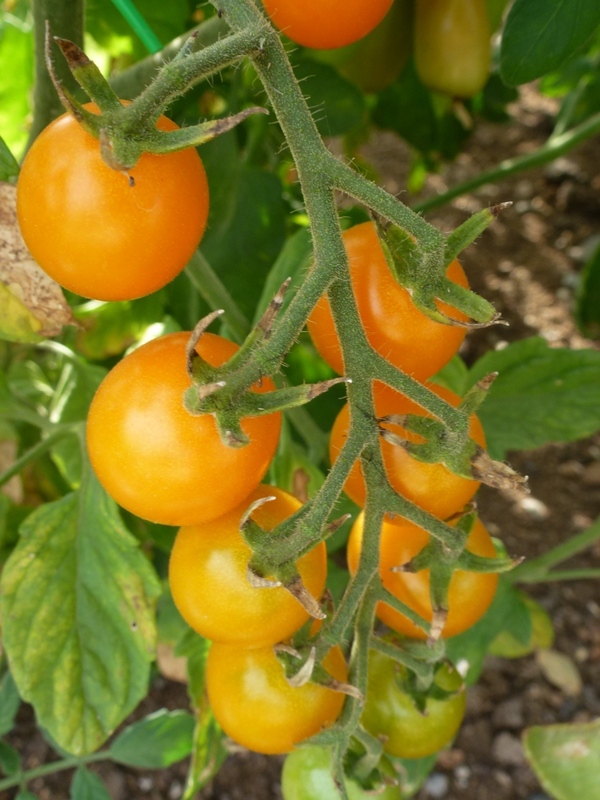 I am picking and so eating so many tomatoes I think I’m turning orange. I’ve made Gazpacho and am about to make tomato soup to freeze and sauce to bottle (this is the first year I’ve decided to bottle tomato sauce so I’ll let you know how I get on and how much work is involved. 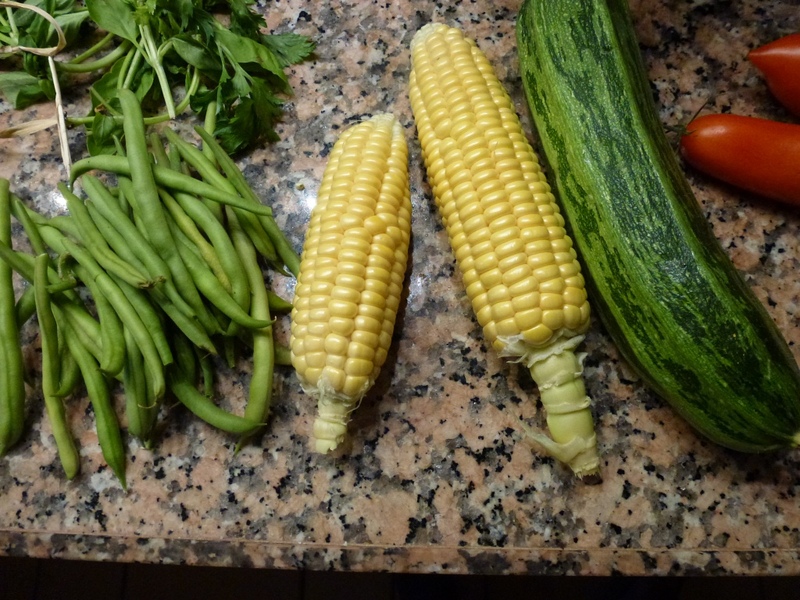 Yesterday I harvested the first sweetcorn; they were picked and cooked within half an hour and were sooooo sweet. The crop doesn’t actually look as good as other years so I’m thinking I’ll so some more and plant a second crop. 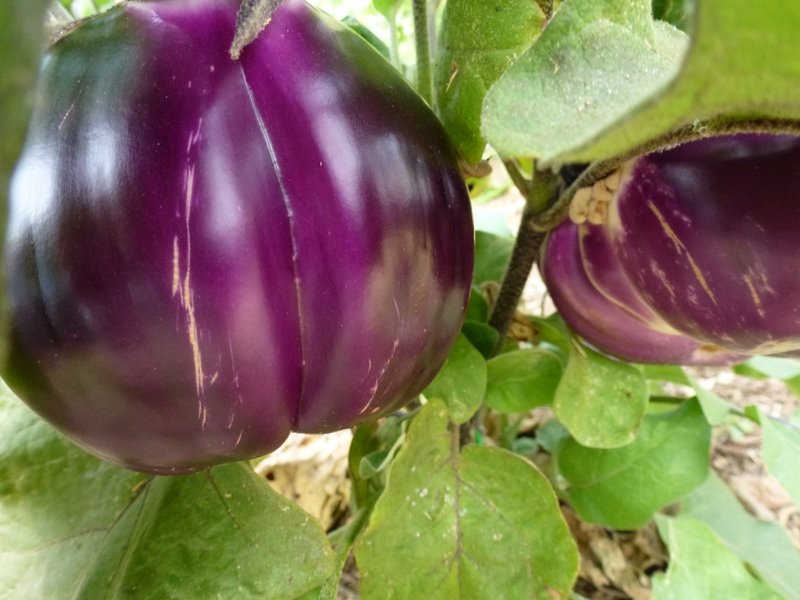 Melanzane (aubergine, eggplant) are just ready now to harvest, they are different from the ones I’ve grown before, I also grew some from seed and amazingly they have some fruit so that’s encouraging, I may grow more of the vegetables from seed next year, growing more of what we really love to eat and what grows well. Melanzane are ready now, luckily I’ve just finished using the ones I froze last year. 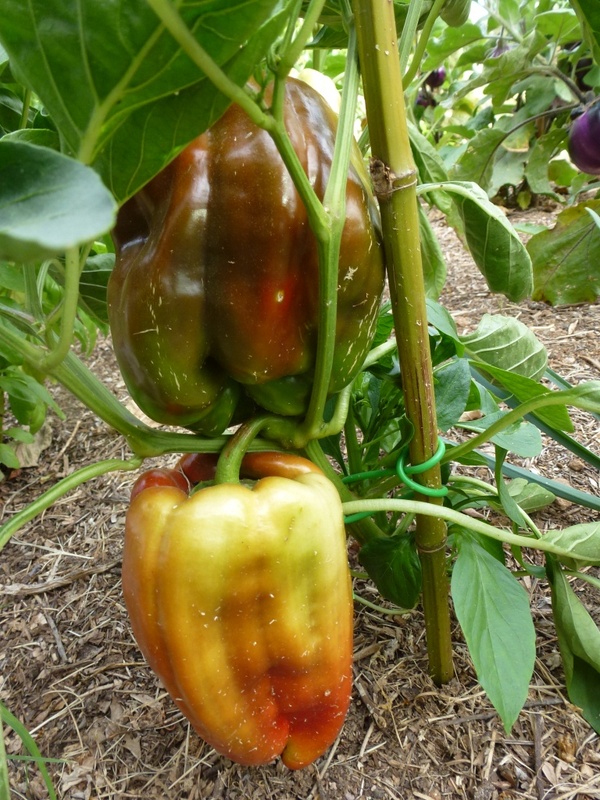 Peppers were ready before the melanzane this year, not sure why; but they need such a lot of water, many have a dry patch on one side but they are turning red (I only use green peppers in Gazpacho) and I’ve increased the irrigation so hopefully the new fruits will be better. All the early heat is definitely making some crops suffer; there have only been two cucumbers so far usually I’m desperately trying to think of new ways to use them. There are still salad leaves, but probably not for much longer as its too hot. 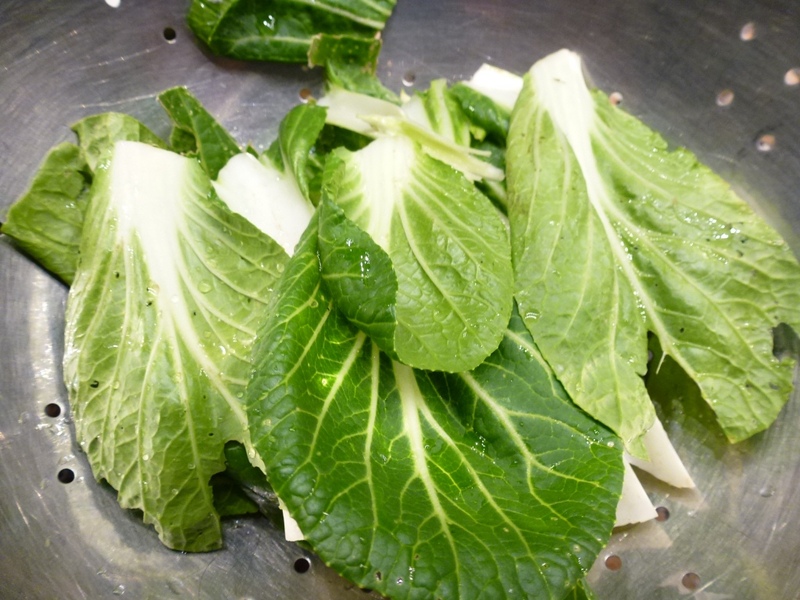 Pak-choi did very well until the flea beetle attacked, now the stems are edible but the leaves are no good, I’ll sow some again for the autumn as they were delicious and very quick from seed to table. 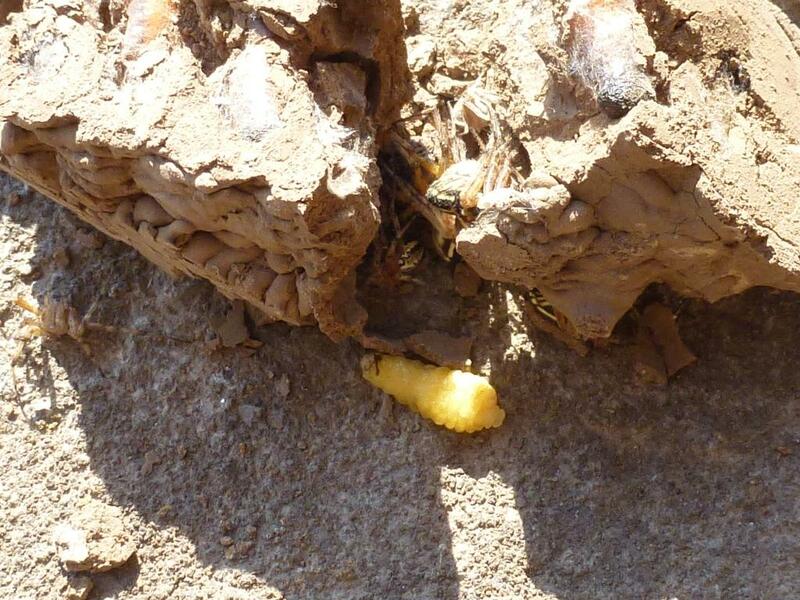 Before the flea beetle, must look into using mesh to stop this pest. 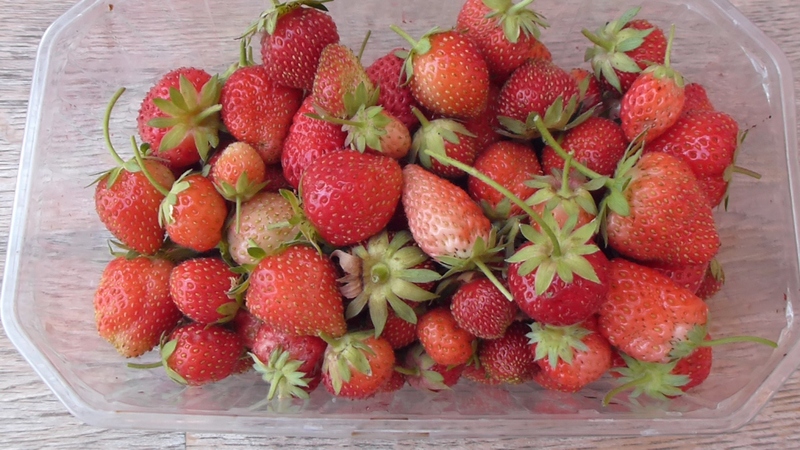 Strawberries are also not enjoying the heat, those planted through black plastic have scorched leaves and the fruit is very small, the ants also disrupt the soil under the plastic but I have been picking enough to eat and lots to freeze ready for jam or gelato so I’m not complaining. 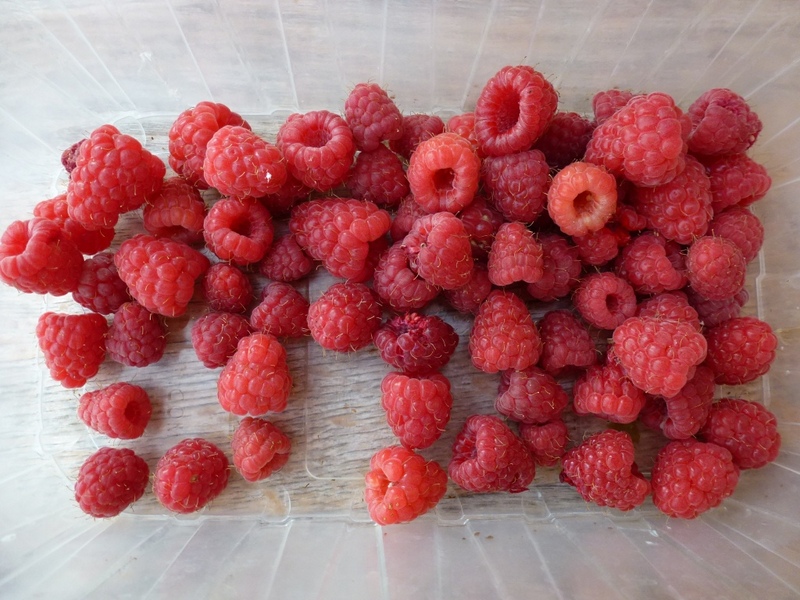 My raspberries are also not as prolific as other years, one reason is the heat, secondly I pruned some of them differently and am hopeful for a better later crop and thirdly while I was a way the birds found them and even though the bushes are now decorated with shiny ribbon the birds aren’t fooled and know the fruit is there! 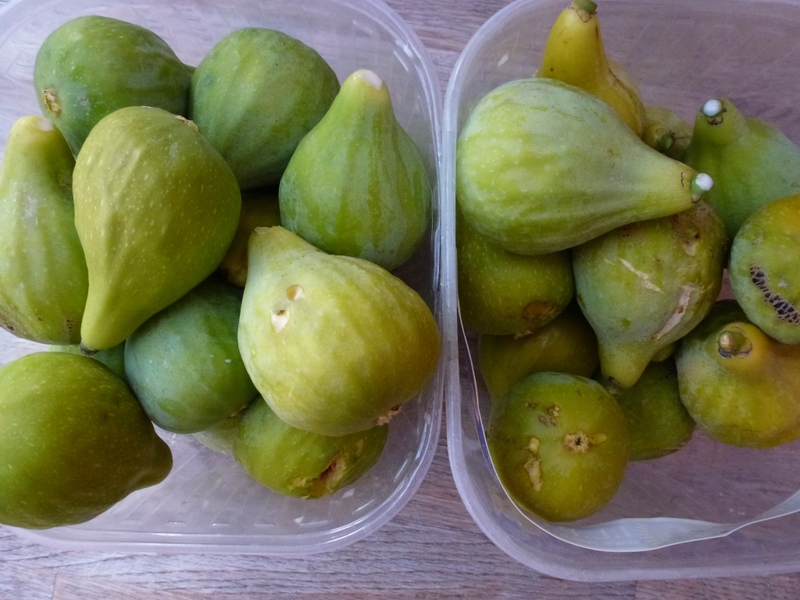 …and best of all there are figs! The tree is struggling and the ants are eating more than us! 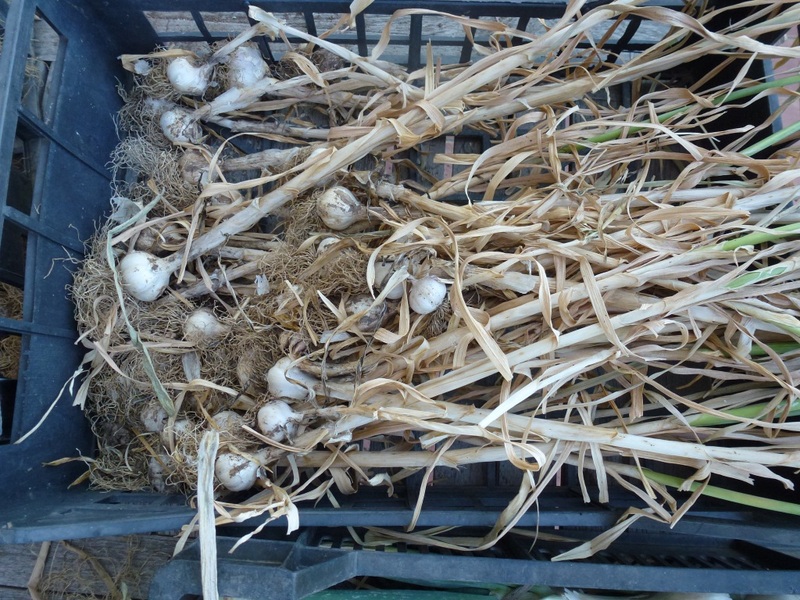 Last week I harvested all the garlic, most had flowers and weren’t as large as other years but expect there will be enough to last the year. 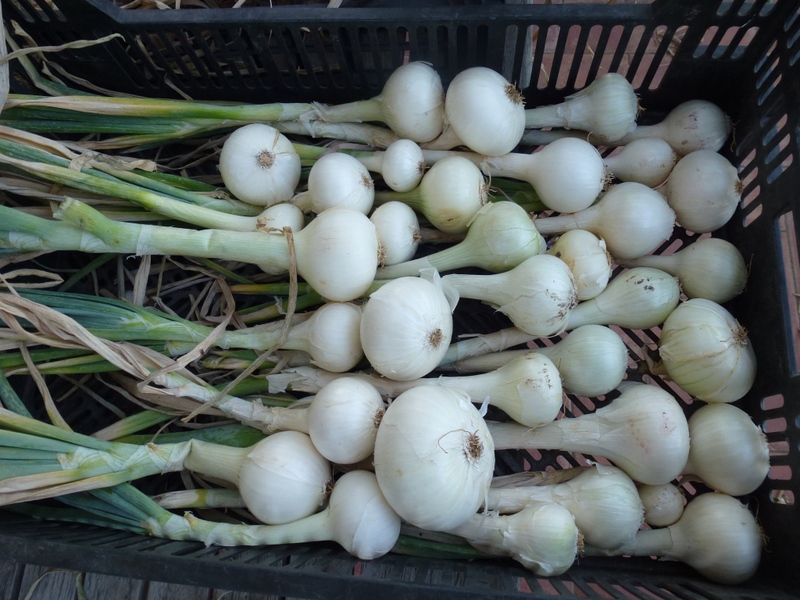 I don’t know if it is the weather but lots of my onions had thick necks last year too (maybe it’s the wind?) some always rot during the winter, but ast year’s harvest produced enough to last until this year’s harvest was ready so I’m not complaining. 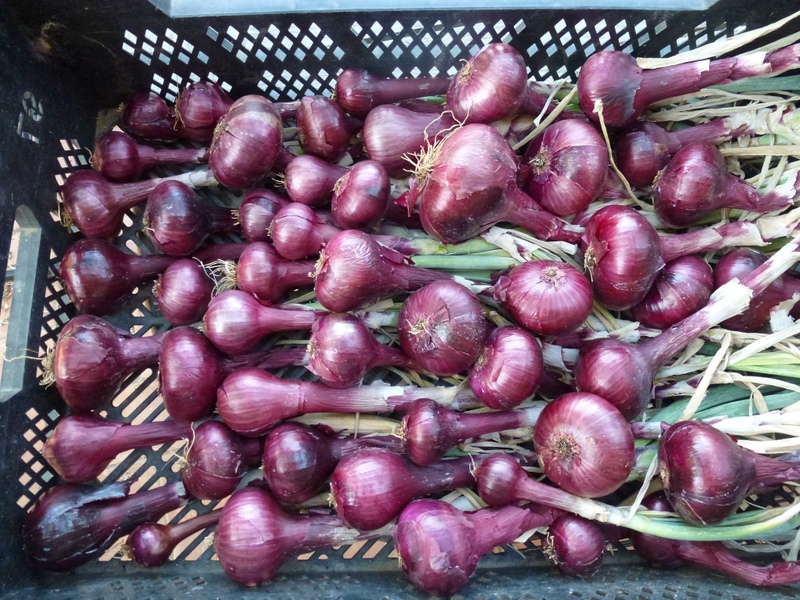 This year I didn’t grow yellow onions which are supposed to keep the best but mine rotted before the others, last year I also grew shallots but I’ve hardly used them, too fiddly to peel when I’m preparing dinner so I didn’t plant them this year. I harvested some Barlotti beans, some to use fresh and some have ripened to be suitable to store as dried beans, I may plant some more of these as I love them in soups or puréed to serve with almost anything. 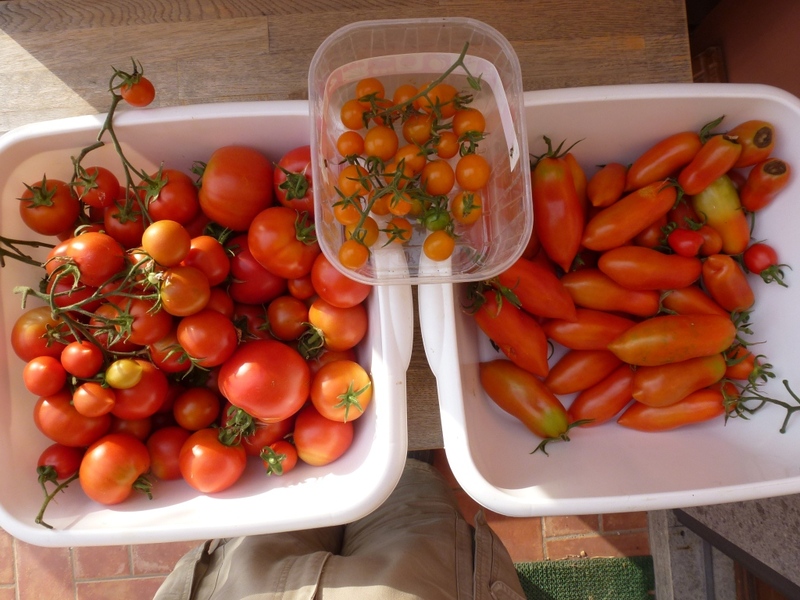 I’ll link to The Gardening Blog when their harvest post is up. 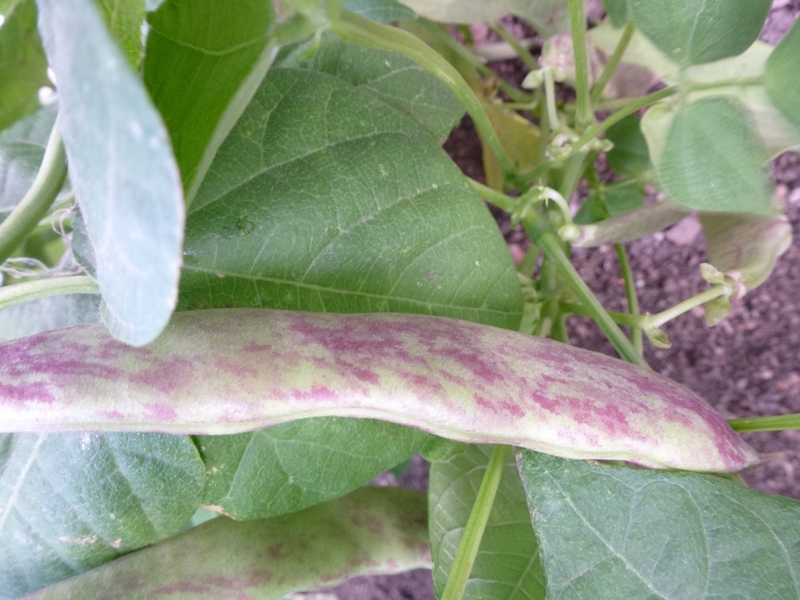 What are you eating from your garden? Whatever it is I’m sure it tastes better than anything you buy in the shops; so ENJOY! Last weekend we drove south to spend the weekend in Puglia, on the Gargano peninsula to be exact. The sea was amazingly blue and it was so hot, the water was where I wanted to be. On the map the Gargano is the spur on the boot of the Italian peninsula. It is mostly a National Park and I’ve been told that in spring there are more varieties of orchids found here than anywhere else in Italy, some that are only found here. While driving to visit some of the different towns we often stopped the car to enjoy the stunning views. By the roadside were wild flowers that could obviously cope with the difficult conditions. what could it be? 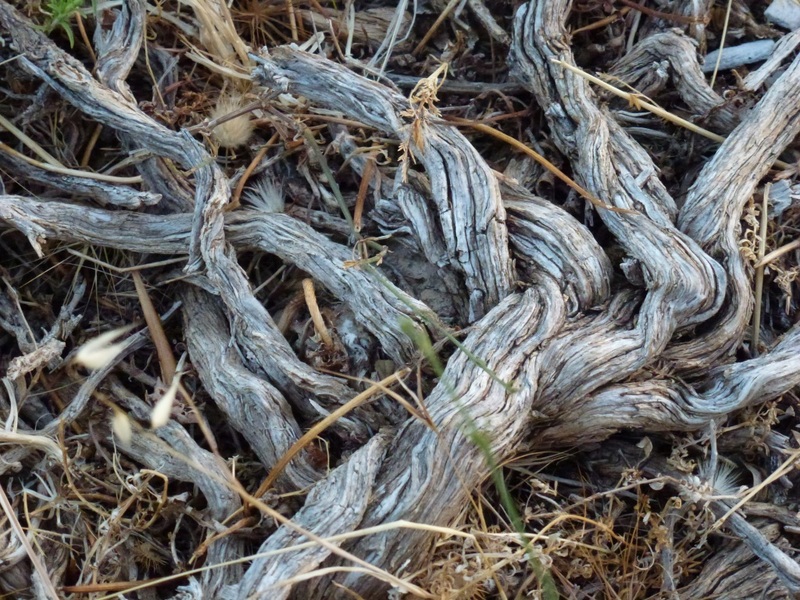 The root of a tree? Cistus? the plant was much smaller than I had imagined it would be. 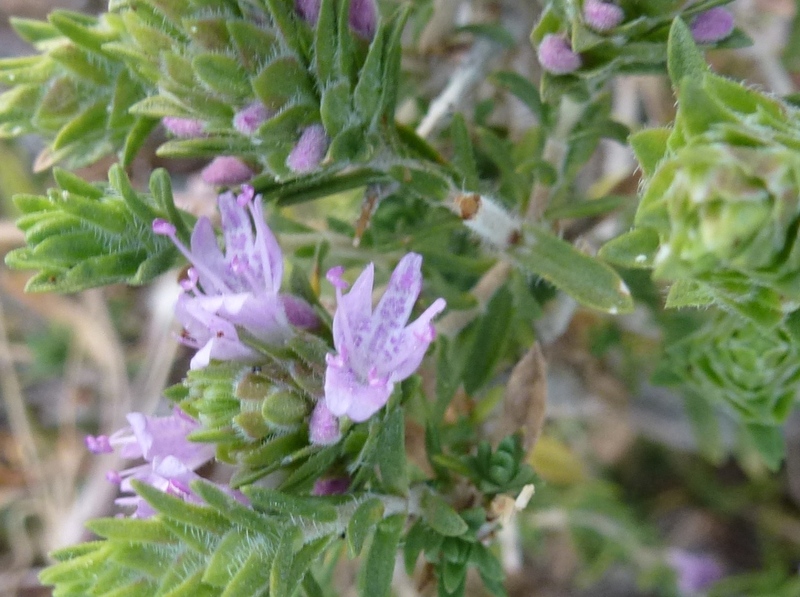 with the foliage and also a few flowers it was easy to identify as a Thyme, certainly the most tenacious thyme I have encountered. At another stop I saw these beautiful flowers. 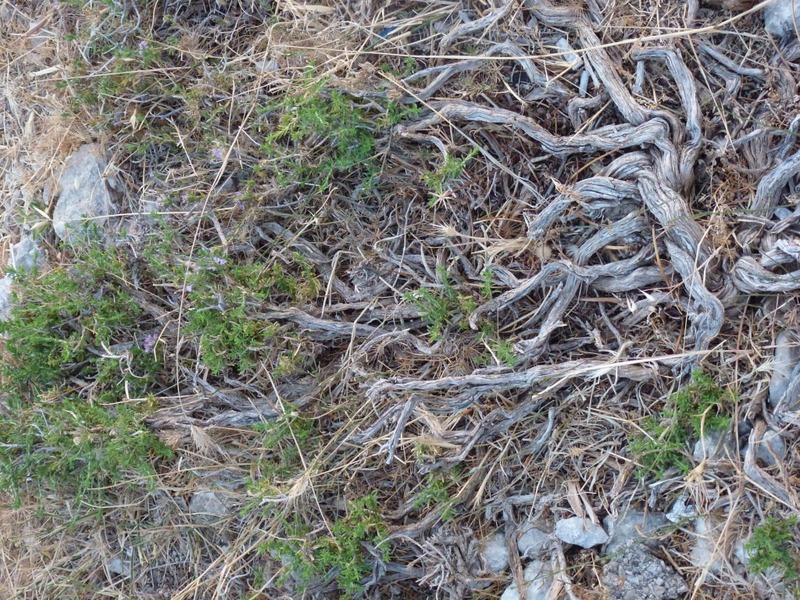 They also grow on cliffs, seemingly not to need and soil at all to survive. From the buds that you can see, can you guess what plant it is? Did you guess? Yes, that’s correct. 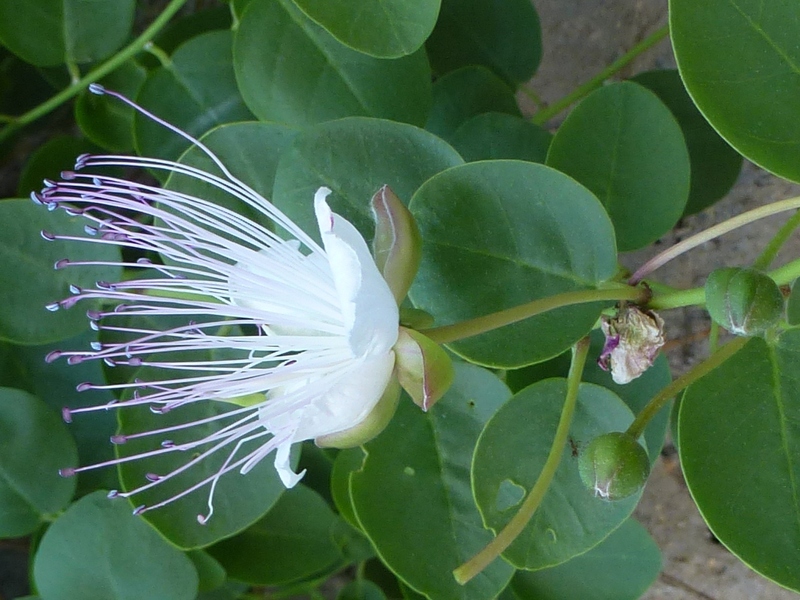 This is the caper plant (Capparis spinosa). The buds are picked and then either conserved in brine or under salt with no liquid which is the way I prefer to buy them as they have a more intense flavour, great on Pizza or in Spaghetti alla Putanesca. The fruits (also conserved in brine) are often served along with olives for aperitivi. 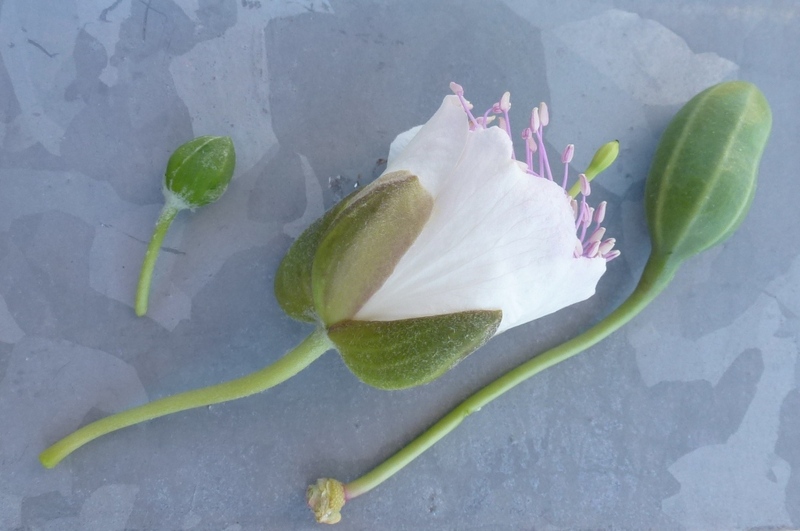 I’ve tried to grow it in the garden but for a plant that seems to need so little to grow, it is very choosy and it is very difficult to encourage it to grow in a garden setting.